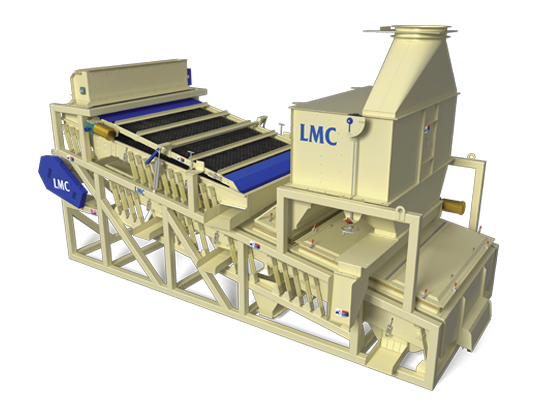 LMC’s revolutionary Air Gap Cleaner provides a new approach to the concept of upstream foreign material removal. Performing foreign material separation early in the cleaning process allows for increased efficiency by downstream processing equipment. When receiving product, unload time is of the utmost importance. The high capacity LMC Air Gap Cleaner can receive large volumes of product, while simultaneously performing accurate and precise cleaning. De-twiggers and sandscreens have been used for decades in precleaning applications. The LMC Air Gap Cleaner includes the use of these proven concepts in addition to the namesake “Air Gap” for stone removal and additional screening for loose shelled kernel, field meat, and/or additional sand removal. The inclusion of the “Air Gap” destoner allows for a significant reduction in stone and heavy foreign material volume therefore allowing downstream precision density destoners to perform more accurate separations. With food safety concerns always increasing, removing the loose-shelled kernels created in the field allows for a concentrated and independent processing line for at-risk product. Product is fed utilizing a variable speed roll feeder to control flow to the cleaner. The roll feeder enables the operator to easily and accurately adjust product flow to fit any situation. The stick belt ensures that extruded foreign material maintains a parallel orientation with the four sections of poly screens and avoids reintroduction into the product flow. The quick change poly screens are available in nearly any size enabling optimum separation. Pneumatic lifts are included to provide easy access to the poly screens. In the aspiration section of the air gap destoner, light foreign material liftings such as leaves, hay, small sticks, and pops are removed as a result of their lower density when compared to that of the acceptable product. The liftings go to an expansion chamber to allow the reject product to drop out of the air stream. The liftings are conveniently discharged via a screw auger for inspection and can provide insight as to whether or not an air adjustment is necessary. Screen combinations, along with deck configurations, can be arranged to perform sifting and scalping operations on the same machine. LMC’s quick change screens are manufactured in 2-foot sections for easy changing. Each machine is custom-designed to include a spouting configuration that matches each customer’s specific situation. Size, location, and orientation of spouts are some of the many modifications that LMC can incorporate into the machine’s design in order to accommodate unique separations or space constraints. The Air Gap Destoner is designed to lift the acceptable product across the air gap. The heavier foreign material, such as stones, heavy dirt balls, and metal will fall through the air gap and out of the product flow. LMC’s unique ball tray design gives the 2-inch ball used for cleaning screens unprecedented random action, and has proven to be far superior to the woven wire systems found in other machines. All ball trays are manufactured in 2-foot long removable sections for easy clean out when sanitation is a high priority. It is essential for product to be properly distributed to the screens in order for optimum separation to occur. If the product is too deep, it cannot be adequately presented to the screens for separation. In most cases, the siftings are generally lighter than the desirable product. A deep product flow compounds the sifting process, thus causing the lighter siftings to migrate to the top of the flow as it travels down the vibrating deck. Increased screening area ensures adequate product contact allowing for greater screening efficiency. With this knowledge in mind, LMC manufactures the Air Gap Cleaner in four different widths to ensure that each customer’s capacity requirement is met.